Lexus stunned the motoring media and the general public when it unveiled the LF-LC concept at 2012 North American International Auto Show. After receiving positive feedback from the media and the public, the Lexus LC 500 and LC 500h coupe debuted last year at NAIAS. The 2018 Lexus LC or Luxury Coupe comes in two variants, the V8 powered LC 500 and the LC 500h hybrid which combines a 3.5 L V6 with a full hybrid drivetrain. The LC is the first model to be constructed on Lexus’ new Global Architecture, or luxury front engine/rear-wheel drive platform. The GA-L platform allowed Lexus engineers to build the LC with a low center of gravity and a lower driving position. 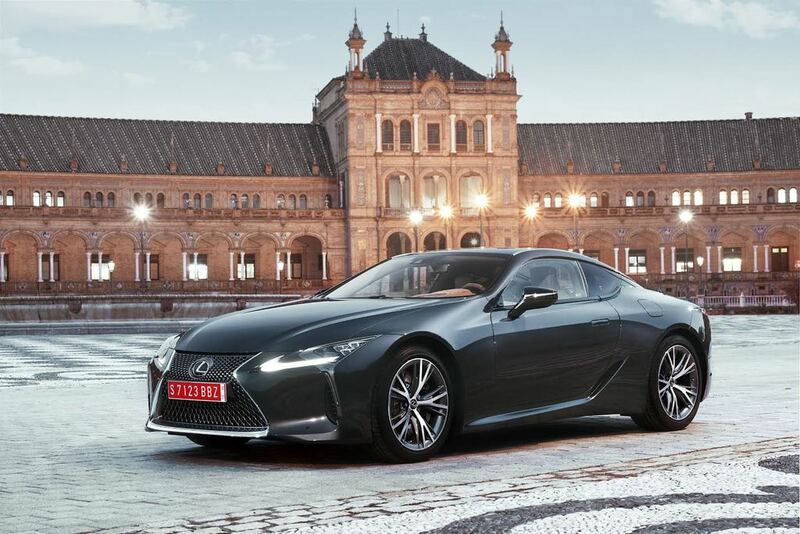 The frame of the Lexus LC is very rigid, made up of materials with different properties such as ultra-high-tensile strength steel and aluminum. These materials are placed strategically in different areas to give the vehicle strength, rigidity, and energy-absorbing performance in appropriate quantities while still being lightweight. The 2018 Lexus LC 500 is powered by a naturally-aspirated 5.0 L V8 engine that produces 471 horsepower (7,100 rpm) and 398 lb-ft of torque (4800 rpm). The engine sends power to the rear wheels via an Aisin sourced 10-speed torque converter automatic transmission. An extra gear was added to eliminate the feel of second and third gears being drawn out for too long, while 10th gear allows for efficient cruising at a reduced engine rpm. The LC 500 sprints to 60 in less than 4.5 seconds, with a top speed of 168 mph. 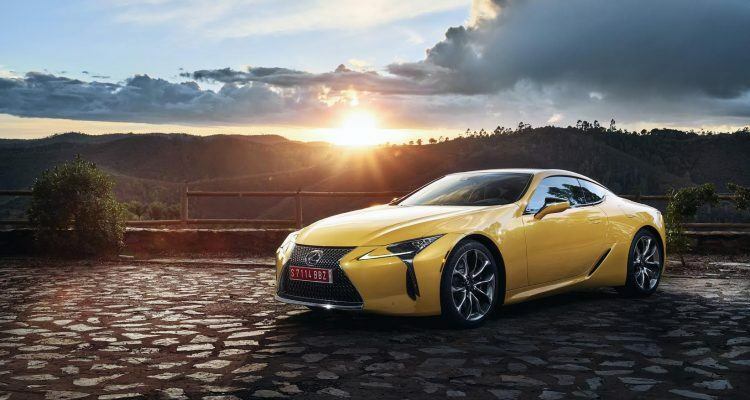 The Lexus LC 500h is powered by a combination of a 3.5 L DOHC 24-valve Atkinson-cycle V6 engine with 295 horsepower and 257 lb-ft. of torque, plus a permanent-magnet synchronous AC motor/generator that adds 59 horsepower. Total combined output is 354 horsepower and 257 lb.ft of torque. The hybrid drivetrain is backed by a continuously variable automatic with four fixed ratios and manual shifting mode. The LC 500h sprints to 60 in 4.8 seconds, with a top speed of 155 mph. The EPA rates the fuel efficiency of the 2018 Lexus LC 500 at 19 mpg city and 28 mpg highway. By contrast, the LC 500h is rated at 30 mpg city and 38 mpg highway. The Lexus LC features double ball joints on each of the two upper and two lower control arms, which allow for better control during the smallest movements, be it from driver inputs or road surfaces. This arrangement helps in optimizing the suspension geometry and creates better steering response overall. Furthermore, a new high mount front suspension features an arm design that enhances steering feedback, while the rear suspension has a low mount configuration and precisely defined arm locations for overall steering stability. To save weight, the upper control arms are made from forged aluminum. Both LC models come standard with 20-inch rims but 21-inch rims are optional. The 20-inch rims are wrapped with 245/45RF20 rubber up front and 275/40RF20 rubber out back. The optional 21-inch rims are wrapped with 245/40RF21 tires up front and 275/35RF21 tires at the rear. The 2018 Lexus LC can be optioned with the Lexus Dynamic Handling system which enhances the vehicle’s sense of handling in a wide variety of driving situations. This is achieved through the combination of the car’s Variable Gear Ratio Steering (VGRS), Active Rear Steering (ARS), and Electric Power Steering (EPS) systems. Equipping the LC with a limited-slip differential enables the driver to accelerate hard out of corners without compromising stability. In order to counteract over- or understeer situations, the limited-slip differential cooperates between the vehicle’s stability control and active rear steering. Outside, the coupe’s athletic profile is characterized by its sweeping roofline, which tapers rearward from above the centrally positioned cabin to create a unique silhouette. Chrome plated moldings along the side of the glass roof amplifies the profile further. The rear edges of the moldings are shaped to echo the lines of a traditional Japanese sword, a design feature we find to be most unique and striking. The blacked-out finish of the roof and rear pillars create a floating effect that visually separates the rood from the rear spoiler. To further enhance the profile of their LC coupe, customers can add the optional Carbon Fiber Reinforced Plastic roof and active rear spoiler. Like on the LF-LC concept, the prominent front and rear spoilers of the LC coupe flare away from the center of the car, housing wide, large diameter wheels. The door panels are pulled inwards, creating a powerful three-dimensional design that mirrors Lexus’ iconic spindle grille. The LC’s unique lighting signature is created by independent daytime running lights in an arrowhead configuration and ultra-compact triple LED headlamp units. The remarkably slim headlight design played a major role in achieving the coupe’s low hood and short front overhang. At the rear, the roof tapers down between muscular wheel arches, reinforcing the car’s wide and stable stance. The Lexus spindle shape is visible at the rear in a three-dimensional form that is generated by lines flowing from the front of the car and along the sides, before cutting around the inner edge of the rear combination lamps. The rear combination lamps, which are set vertically at the outermost edge of the bumper, have a graphic that guides the eye in three directions, accentuating the flow along the sides of the body, while emphasizing the vehicle’s strong, planted look. Within the combination units, the taillights feature a new Lexus concept, using mirrors to create a multi-reflection, three-dimensional sequence of L-shaped graphics. The LC’s dynamic luxury theme from the exterior is carried throughout the 2+2 cabin. The driver-focused cockpit is designed to provide sophistication and intricate attention to detail. The cockpit is ergonomically designed to instill confidence and invite spirited driving, with an intuitive layout of the controls and seating position. Drivers will enjoy a good view of the road, which has not been compromised by the seating position thanks to the low hood line, the instrument panel profile, and the location and narrow width of the A-pillar. 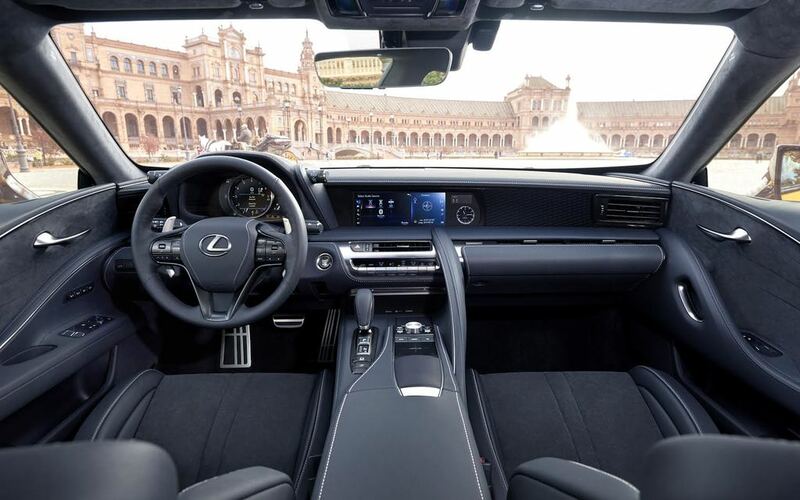 Lexus engineers have paid particular attention to the steering wheel design with a change in the cross-section around the circumference to allow for variations in grip and twisting of the wrist. The paddle shifters are made from magnesium alloy and are designed to allow for easier hooking with the fingertips, providing a substantial feel when used. The information displays are arranged in order of importance with the most important one positioned closest to the driver’s sight line, and within the dashboard’s upper display zone. The instrument binnacle houses the latest version of thin-film transistor (TFT) technology which was first introduced in the Lexus LFA supercar. Important switches and controls are located around the steering wheel too. These include the paddle shifters, steering wheel switches, Drive Mode Select switch, starter button, and shift lever. Lexus’ latest generation of Remote Touch is located in the center console too. The seats of the Lexus LC are designed to provide occupants with the best possible combination of support and comfort. Lexus achieved this with a new, two-part construction in which the main seatback drapes over the shoulder area of the seat and wraps around the back. Additional bolstering is provided for the driver’s shoulder blade to ensure superior lateral support, and resin inserts enhance the holding performance of the side bolsters. The bolsters on the optional sport seats are even more substantial, with a focus on keeping the driver’s back in place during high-speed cornering. The seat cushions have been shaped to ensure excellent support for the pelvis and the pressure is evenly distributed front and back. The interior of the 2018 Lexus LC can be finished in four color schemes: Bespoke White, Mid Brown, Rioja Red, and Black. Bespoke White is exclusive to the LC and combines a mid-blue finish for the upper door trims, steering wheel, instrument panel, and center armrest, with contrasting white seat upholstery and vivid orange for the door panels and shift lever surround. If you fancy a highly luxurious feel inside your Lexus LC, then the Mid Brown option provides a monotone finish throughout the cabin in warm harmonizing shades of brown. The 2018 Lexus LC 500 and LC 500h will arrive at dealerships next spring. 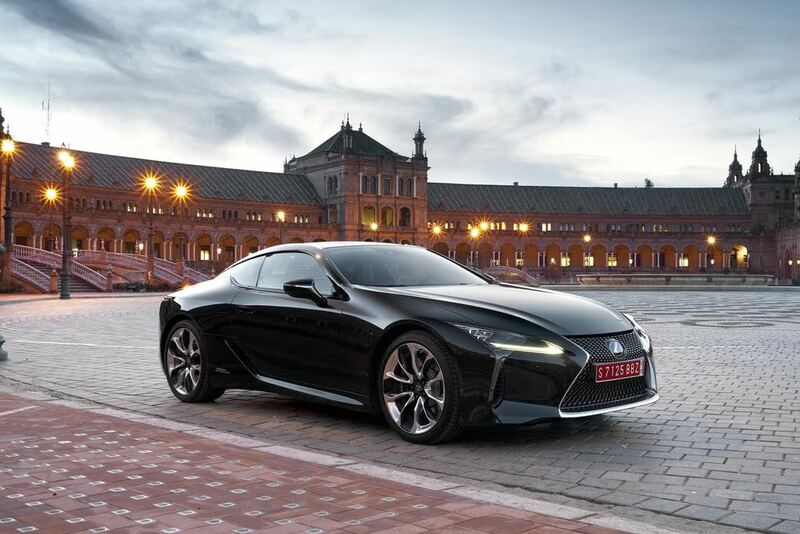 Lexus expects to sell roughly 4,800 LC cars annually in the United States; it is estimated that only 20 percent of them will be the hybrid version. At the moment, Lexus has not announced the official pricing for the LC 500 and LC500 h. Based on the competition, we estimate the LC 500 will start around $95,000 and the LC 500h will start around $100,000 USD. The LC is built at Lexus’ Motomachi plant, home of the hand-crafted LFA supercar. Rahul Raman is the Founder of CARS 360 Mke, an automotive news outlet. He is a regular contributor to Automoblog and the author of our First Look series. No Comments on "First Look: 2018 Lexus LC"